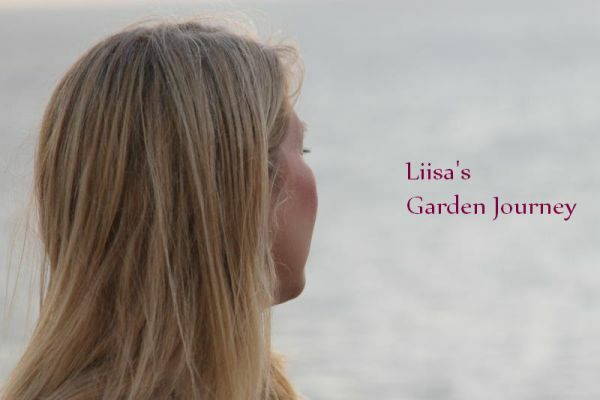 Liisa's Garden Journey: I'm back! 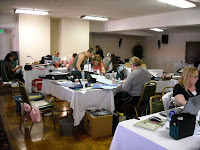 I'm back from my scrapbooking retreat. 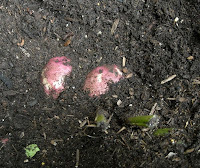 I had a great time but I'm glad to be home and back out into the garden. 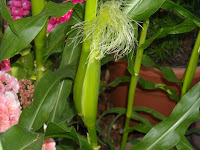 Here are a few photos from the retreat and then we will get to the garden photos. This is the room we were in. Like I said in my last post there were about 30 women there. 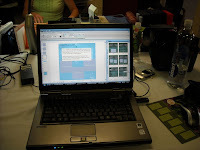 Most everyone was doing traditional scrapbooking and a few of us were doing digital. 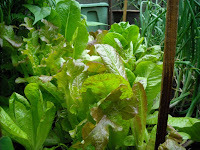 Before I left on Friday I gave everything a good watering and harvested some raspberries and lettuce. Sweet Husband, Son and Son's Girlfriend did a great job taking care of my garden while I was gone. 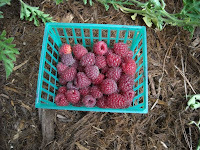 They even picked some more raspberries and weighed them for me before they ate them. It's a amazing to me how fast things grow when you are gone for a few days. Photo Below: These strawberries are just about ready for picking. 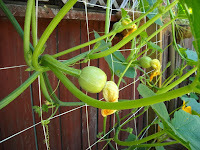 Photo Below: I hand pollenated three female pumpkin flowers last week. When I got home I was happy to see they are growing. 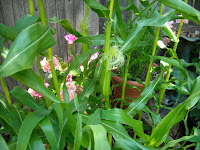 So far there are two ears of corn each on six of my stocks. Today the wind picked up and I gave them a little wiggle. I could see the pollen falling on to the silks. I hope I get good even pollenation. 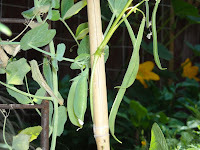 Photo Below: The pole beans mixed with the sugar snap peas. 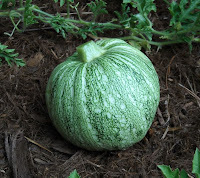 Photo Below: Spaghetti squash is getting big. There are five more just a bit smaller than this one. 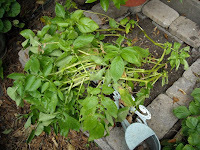 Photo Below: Bush beans are doing great. 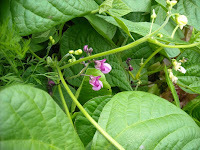 They are blooming and I have a few beans that are about 2 to 3 inches long. 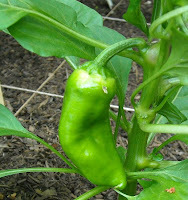 Photo Below: One of the two red baby bell peppers. They haven't started turing color yet. 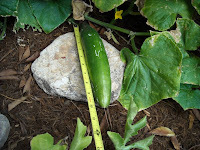 Photo Blow: The English cucumber has two more inches to go and I will be able to harvest. 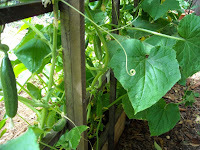 Photo Below: The baby cucumbers put on a lot of growth while I was gone. When looking at this photo full size I counted 10 cucumbers. 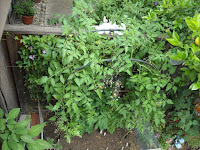 Photo Below: Cherry tomatoes are doing really well. 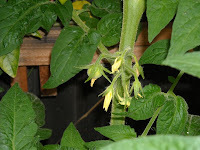 Photo Below: Finally a tomato on the container bush tomato plant. 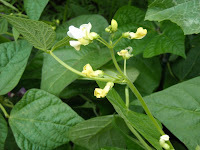 Photo Below: Bush bean blooms. Photo Below: Looking down on top of the tomato bed. 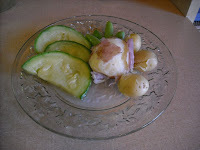 One of the round zucchini was ready to pick today. 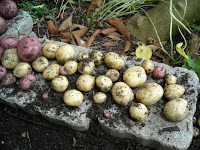 I was going to pull potatoes in bed 1 in a few weeks but now I think I might wait until July to see if I can get a bigger harvest. 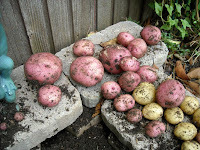 I will try potatoes again next year for sure. 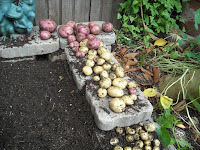 Photo below: Potato bed 1. Not looking so good but I'm hoping for gold under there. We'll find out in about a month. 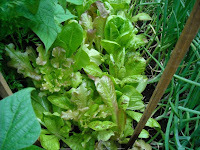 Photo Below: The red norland cleaned up real good. Great progress! Those potatoes look really yummy, and I can't believe you really get on the roof. That's so funny! 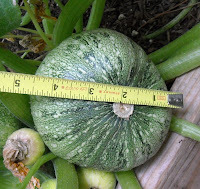 Do you have 5 spaghetti squash on one plant? Those potatoes look sooooo good. I can't hardly wait for mine. 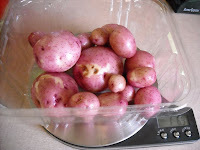 Those teeny tiny ones would get a rinse, a shake of salt and immediately be eaten raw. 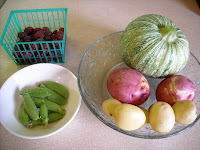 You have quite a talent at growing food and taking awesome photos of it! THanks for the great post. Thanks! 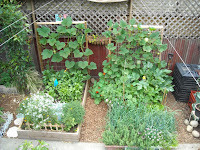 I have two spaghetti squash plants on that trellis with a total of 11 squash. I'll have to try the raw potato and salt thing. You must be feeling pretty good right about now...a nice weekend spent on one hobby and harvesting the fruits of your labor on another one. I love that you can get your family to weigh before they snack! 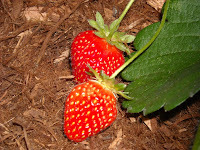 lolz... my toddler has decimated the strawberries - she's worse then the slugs - I'll never get an accurate count. ;^) Your raspberries look really good too, I've got to figure out where I can plunk a cane or two. 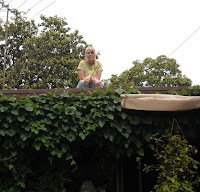 What a great picture of you up on the roof! You're like a little birdy! 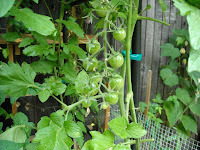 over in my garden, i spotted what i think is a teeny tiny baby tomato...i'm elated!!! Oh Kelli don't be envious. I think your garden is looking just wonderful. Everyone got a lot done on their scrapbooks. I mainly worked on my layout and journaling. I still need to add photos. I'll take some photos once I get to the point I can print the pages and put them in my book. It won't be long how and you will be eating tomatoes. 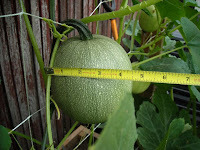 I have a few that are starting to ripen.